The memorandum of appeal for Neil Bantleman was filed on Wednesday April 29th to the High Court. The appeal for Ferdinant Tjiong is still in the process of being filed. These new developments raise questions as to what other information has been withheld, casting shadows of doubt over the original allegations. It is obvious the prosecuting legal team in the civil case has grossly misinterpreted the two new medical lab results. The results prove the boy does not have herpes, whereas the lawyers must have believed the opposite, otherwise why would they introduce them in court. 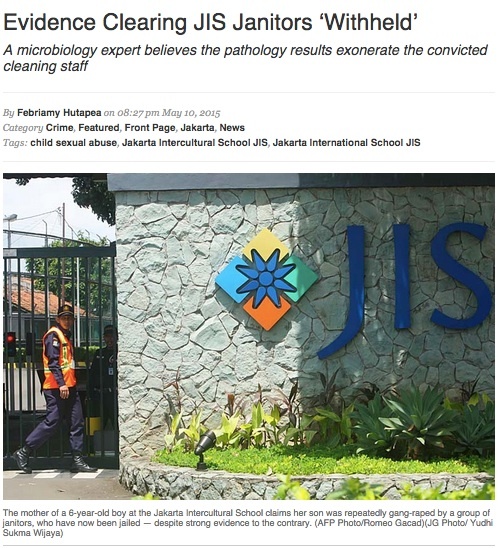 One might also wonder why these medical reports were not included in the criminal cases against both the PT ISS cleaners and Neil and Ferdi. This lack of consistency in the police dossiers between the two cases, in regards to medical results, raises even more questions regarding the possible purposeful omission of evidence and or tampering of evidence.